The air plant growth cycle is so exciting because that’s when we see the emergence of baby air plants from the parent plant. When an air plant flowers, it is getting ready to produce pups, or air plant babies. The million dollar question is: How do I get my air plant to flower? 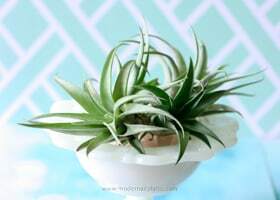 My answer is to give your air plant good care and you will be rewarded with flowers and pups, as part of the natural air plant growth cycle. The first stage of the air plant growth cycle is the reproductive process is the emergence of an inflorescence. The inflorescence includes the whole flower stalk from which the flowers will eventually emerge. Some air plants produce a single flower, while others produce a cluster of blooms. Likewise some flowers are long-lasting, the xerographica’s flower can last up to a year long, while others will last only a few days. Although they only bloom once, the air plant lifespan is not over when the flower has died. The air plant will live for several years after blooming and reproducing. Tip: To lengthen the life of the bloom, when watering try to keep the flower out of the water. The next stage in the air plant growth cycle is flowering. 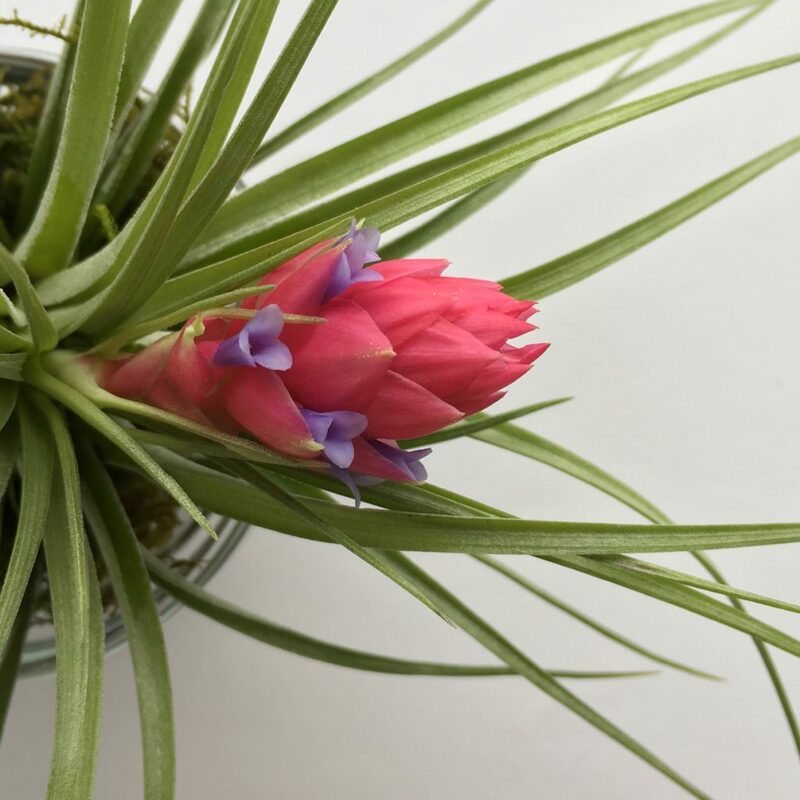 A blooming an air plant will produce 1-3 little plantlets, or pups. Usually these little offsets can be found at the base of the plant, but they can also be found protected under dying leaves (so use caution when trimming up your plants). On some varieties pups will emerge out of the flower stalk. 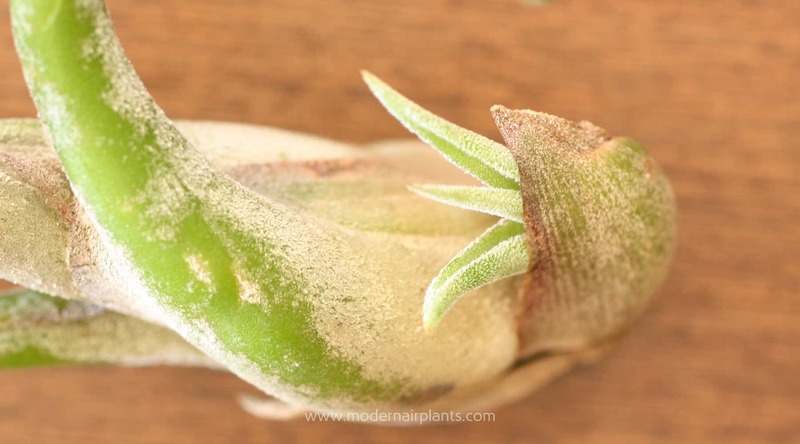 Once the air plant pup is about 1/3 the size of the parent plant they can be carefully removed with sharp scissors, and you will have increased your air plant collection. If left alone the air plant will form a clump. I’ve worried that because my air plant’s flower was damaged, the plant wouldn’t produce any pups, I was so relieved to be wrong. So, even if your flower doesn’t last like you’d like, you will still probably still get pups. Having your own air plant clump is indeed an enviable possession. That is why most air plant growers, myself included, would much prefer to leave the pups attached and allowed to clump. Most individual air plants are fairly inexpensive, but an air plant clump is a real prize. TIP: If you are interested in growing a clump, two varieties that clump easily are the Tillandsia ionantha fuego and the Tillandsia bergeri. After flowering the air plant will also produce seeds. In their native habitat this usually occurs in the dry season so that the seeds will not be washed away by the rain. Then, when the rain does come the seeds are ready to germinate and grow. In the greenhouse producing air plants from seed is a lengthy and tedious process. It takes years to grow air plants from seed. The seed must be kept damp, but not too damp as to encourage fungus. The germination process takes about a month and the first few years of growth are very slow. Once the air plant reaches about an inch in length the growth rate increases. Despite the meticulous effort, the results are worth it. 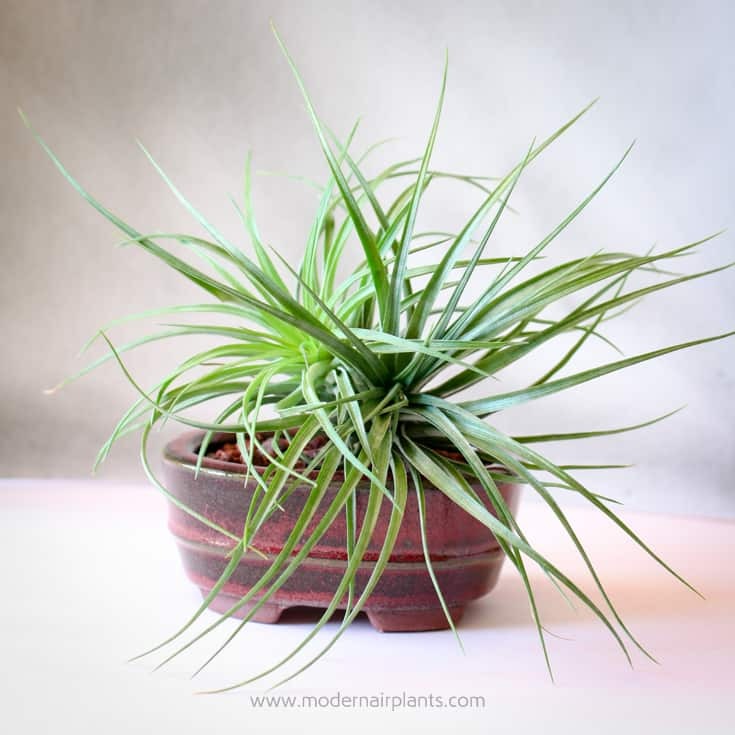 Air plants grown from seed tend to be very healthy, vigorous plants. 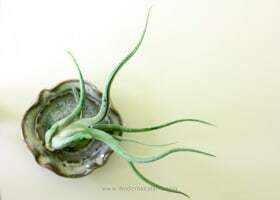 I’ve never grown an air plant from seed, but if you have, I’d love to hear about it! A lot of people wonder how big air plants get, or if they even grow at all. Air plants are slow-growing plants. In a lot of ways this is a good thing since they will not outgrow their display for a long time. If you want a large air plant, I suggest buying one that is already large rather than buying a small one and waiting for it to grow bigger. If you want a large air plant, start with the T. xerographica. This air plant is big and beautiful with elegant long leaves. Likewise, if you’re interested in small air plants T. ioantha,T. butzii, T. bulbosa Guatemala and T. fuchsii are all small. Although all air plants start out small, so little is readily available. Tip:When purchasing air plants online, you can always add a note to the seller letting them know which size of air plant you are looking for. To answer the question: How big to air plants get? The answer is: It depends on the air plant. Some can be up to 3 feet long. Air plant clumps can grow indefinitely and are treasured among air plant enthusiasts. Air plants that are small individually, like the T. ioantha, can become large clumps. Whether or not your air plants are currently in bloom, enjoy them! That is one of the things I love about air plants, even when they are not flowering they are still beautiful. When they do flower they often reward us with pup! It’s a win-win. It’s great to know how these plants bloom and produce pups. I’m really learning a lot about these little treasures which I had bought from San Mateo, last November and they’re really doing well in Agra,India, where I reside. Air plants are very uncommon in our country. This makes them, unique. I really thank you from the bottom of my heart for all the tips. They are fairly unusual in the US as well. When I tell people I have a website about air plants, they wonder what air plants are. You’re right – air plants are little treasures! Great article! I have a Stricta Soft leaf that has a bloom on it! Lately in the last month I’ve noticed the bottom area where the leaves fall off has turned brown through all leaves. Is this lack of water? I water once a week. My others are doing well. I have this one near a kitchen window that gets afternoon sun and I give them lots of air through that window. But perhaps it’s gotten too much sun even though it’s a winter sun here in San Diego region. Thank you! After a while, the lower leaves will grow old, turn brown and die. If this is the case, simply remove the lower leaves. If the air plant is brown and squishy at the bottom, the air plant may have rotted at the base. Unfortunately, rot is irreversible. In the future, just be sure to let the air plant dry out up-side-down really well after watering. Hopefully, the stricta will produce a pup or two for you! Have a lovely day in gorgeous San Diego! Approximately how many years can air plants live for? Thanks so much! I wish I could give you an approximate answer, but all I can say is for several years. I don’t have an exact time frame. My air plant is growing and is almost to big for the bowl i have. Can I put it in a bigger bowl so it can have room to grow. Congratulations taking such good care of your air plant that it’s growing and thriving. Yes, of course, you can place it into a larger bowl. Is there a good site or app for identifying air plants and how they bloom and have pups?? 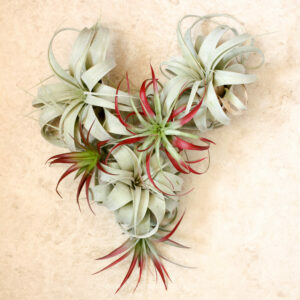 To initiate blooming all you can do is to give your air plant proper care. The three pillars of proper air plant care are indirect light, water (soak and dry), and air movement. Best of luck with your air plants! Thank you so much for your article. I have recently become interested in growing air plants. So far I have only done some research. I have a couple of questions though. How is it best to grow a clump – hanging, in a dish or on wood or……? How is a plant anchored to an object to begin? I will look forward to any help you can offer. Thank you much. Thank you for your thoughtful questions. Growing clumps are lots of fun. I too like to grow clumps. I figure single air plants are easy to come by as they are fairly inexpensive, but a clump, now that is a real treasure! I don’t know that there is a best way. 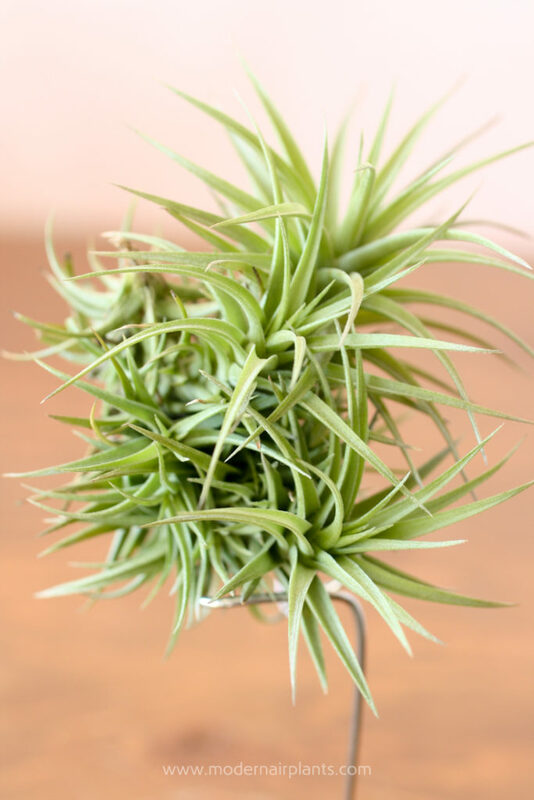 But the ways that you have mentioned – hanging, or in a container, or mounted are all possible ways to successfully grow air plants. I have grown them both hanging and in a dish. If you choose to grow in a container, it is vital that the clump is allowed to thoroughly dry after soaking in water before returning to the container. An open dish provides more air movement than a bowl with a small opening or a terrarium type enclosure. As far as promoting the health of the air plant, I recommend an open dish or hanging the air plant to a terrarium. My plant, a large type, bloomed in spring but still no pups. Is this typical? It takes a lot of energy for a plant to produce pups. Be sure that your air plants have enough light – which is like food for your air plants – water, and air movement. Is usually takes a couple of months for the pups to form – so if you don’t have pups by now, I’m sorry to say, but they probably won’t come. Hopefully, one of these air plants will have better results for you. Remember the three pillars of air plants care: water (soak and dry), light, and air flow. 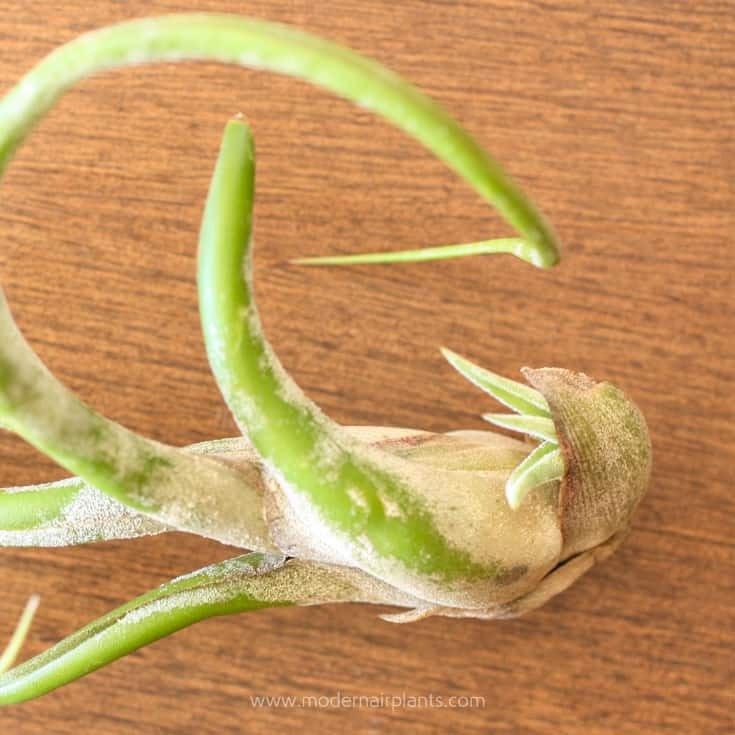 These three hints will give you healthy and hopefully reproducing, air plants. Have a great day and thank you for reaching out to me. In your picture on this post, one of plants in the clump seems to be upside down. Why is this? When new pups grow on a clump they seem to grow out in any direction. They don’t care what is up or down. This helps is what gives them a “clump” shape. I was given an air plant growing in soil. It is doing very well, now ready to bloom and there are 3 pups peeping at me! Can I remove it from the soil now and display it without soil. Yes. Air plants do not need to grow in soil as they absorb water and nutrients from their leaves, instead of their roots – like most other plants. I’m glad I found your informative article about air plants. I have around 10 airplants currently. 2 of them are flowering and 2 have pups attached. Do you have a favorite place to order your air plants? However, I am bit worried,since when I bought my air plants in a hurry from nursery,I found out by the time I cam home that my air plant had already bloomed and turned black and dried ,are there any hopes that the plant will bear pups for me? What time does it takes for average air plant to bear pups (taking in consideration that I am having an Tillandsia Ionantha Fuego). Hello! I am interested in letting my air plants clump up and a couple of mine have already had pups! But I’ve been wondering – do some varieties die after their pup is full grown and others not? Is that why some are better for clumping than others? The sad truth is that air plants will only bloom once–and eventually–they will die. The good news is that they will not die right away. The air plant could live for many, many years. I love growing clumps. Sometimes an older plant dies, but there are lots of pups that have replaced that plant. Sometimes the mother plant is so surrounded by pups that it is impossible to remove. After awhile the dead plant shrinks up so you can hardly notice it. Don’t worry about the mother plant dying. Yes, it will happen, but hopefully not for a long while. 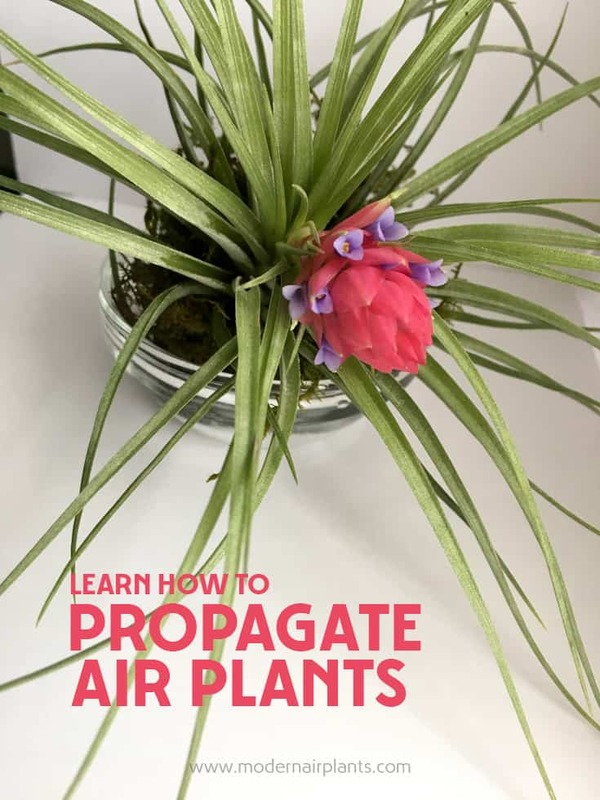 I am on Pinterest this morning and so happy when one of your air plant articles popped up and I read it I have since created a board for air plants,naming it…Something in The Air! Thank you Anna for your very easy to read and even easier to understand,articles. 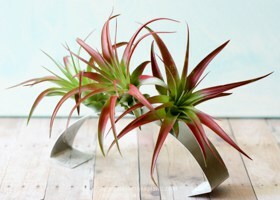 The way you explain each nuance and care tip for air plants,so that the most novice grower can understand,is awesome! Anna I have a new interest in purchasing and growing air plants because of you ??? Thank you for your kind words! They are very much appreciated! 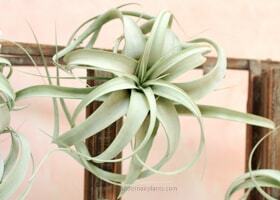 You will love growing air plants! Soak them in water weekly. Let them drain after watering. Give them good light. And you’ve pretty much got it! Thanks Anna for your very invaluable lessons. Can’t wait to increase my collections through offshoots. Looking forward to learning so much more. It is VERY exciting when air plants bloom and tiny air plants begin to grow off the mother plant! Wishing you lots of baby air plants! Thank you so much Tammy! Please, let me know if you have any questions about growing or displaying your air plants. I have 2 plants that are growing pups but the plant never produced any blooms. Is this uncommon? Great question Linda. Depending on the variety, air plants can produce pups before, after or while they bloom. Wow! Who knew air plants have such amazing, colorful flowers. Thanks, Anna! Thank you Nancy! Some flowers are more colorful than others, but they are all amazing-as are the the pups that follow the flowers!